Sports Injuries in School: Do You Have a Lawsuit? Many children play sports in high school, and injuries are bound to occur in contact sports like football, soccer, and wrestling. But does your child have a valid legal claim for an injury? First, parents must realize that some injuries are inherent in the nature of play. 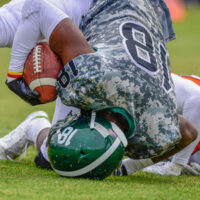 According to the Florida Supreme Court, anyone who willingly participates in a contact sport is expressing consent that they are assuming the risk of injury. If a child suffers bad bruises or sprains in a soccer or football game, then they probably do not have a lawsuit. However, you should analyze your case with an experienced Daytona Beach personal injury lawyer before taking any steps. Was Your Child Intentionally Injured? In these examples, a participant intentionally wanted to injure your child and succeeded. As a result, you can probably sue. Were Coaches or Schools Negligent? In these cases, a lot will depend on the circumstances, such as what the school knew and when. But when a school has not acted with proper care, they become legally liable for injuries. Meet with an attorney right away to check whether you have a case. Do You Know How to Sue a School District? It is always complicated suing school districts since the state of Florida and its agencies enjoy immunity from lawsuits. However, this immunity is waived in certain circumstances. To find out better whether you can sue, you should quickly meet with a personal injury attorney after your child is injured. At Bundza & Rodriguez, our Daytona Beach personal injury lawyers have helped countless clients get compensation for medical care and other expenses. We will carefully review the circumstances of your case to determine your best path forward. For help, please call us today, 386-252-5170. We offer a free, initial consultation where you can ask any question that you want.